Progress has slowed on my project because of a few tricky steps and going back to work but I was pleasantly surprised to find when I counted up that I've done just over half the steps on the instruction sheet. Problem number one was that because my grading was not as accurate as it could be the stay pieces didn't fit together exactly. I had a bit of a problem getting it to lie smoothly. Problem number two is a bit more complicated to explain and I'm still not sure if its my fault or a problem with the order of construction. Everything was going together as stated in the instructions and looking like the little diagrams until steps 17 and 18. I just can't see how the raw edge from the front fits into the stay. It is impossible! I undid it, redid it, undid it. It just doesn't make sense to me. 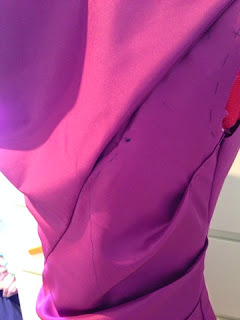 In the end I had to clip the front so I could sandwich most of the seam and as you can just see in the picture below I've turned in the rest of the seam and tacked it down for the moment. I now just need to sew it down by hand from the back. Problem number three. 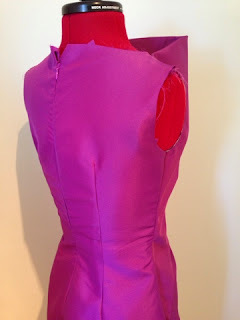 The stay and the dress are meant to be the same length and step 19 tells you to sew them together by hand 2" above the lower edge. My stay is exactly 2" shorter than my front! I really don't think I could have done this by accident - I'm blaming Vogue. I've finished off the lower edge of the stay and will just wait to see what happens with this as construction continues. Good news! 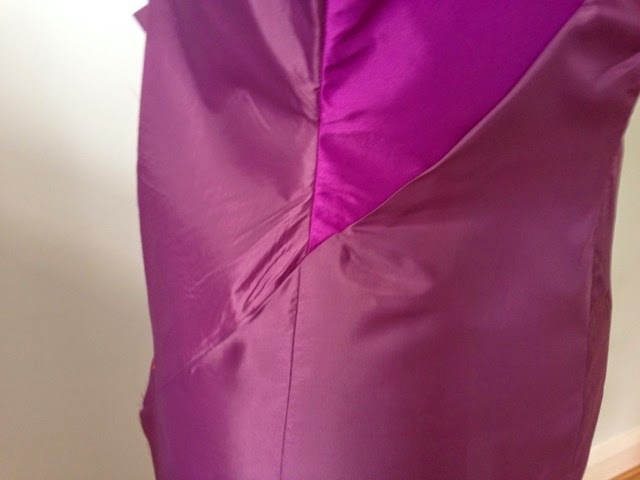 I managed to find to track down a matching zip - described as magenta. This went in very slowly but not too badly. 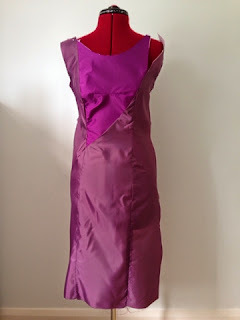 Having tried it on for the first time the fit seems good, my generous seams have worked. Only one more sewing weekend left, best get on with it.